The Planet Phaeton - did it shatter to form the Asteroid Belt? The planet Phaeton is the name given to a hypothetical object once orbiting between Mars and Jupiter that, in the early days of the Solar System, was destroyed by some event. The resultant debris then became the Asteroid Belt. Back at the start of the 19th century, the Asteroid Belt had yet to be discovered. 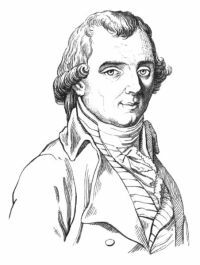 Then, in 1801, a Catholic priest named Giuseppe Piazzi, who was also an astronomer, discovered the largest asteroid, Ceres. As it was generally believed at the time that there was a planet orbiting between Mars and Jupiter, Ceres was believed to fit the bill. Then, the following year, German astronomer Heinrich Olbers (pictured here) discovered another body with a similar orbit, the asteroid Pallas. From this, Olbers deduced that these two bodies were actually fragments of the planet that was thought to be between Mars and Jupiter and it had been destroyed in some way. The subsequent discovery of two more asteroids, Juno and Vesta, seemed to vindicate this. It wasn't until the 20th century that this destroyed object was named Phaeton. This was the name of a character in Greek mythology and means "shining one". He was the son of the sun god, Helios, who, it was thought, rode his solar chariot across the sky every day, causing the light and heat that humans needed to survive. One day, Helios granted Phaeton's wish to have a go at driving the chariot himself. However, he was unable to control the horses, everything went wrong and Earth was in danger of being burnt to a crisp. The solution? Zeus killed him with a thunderbolt. Olbers' idea was christened the "disruption theory" and, naturally, several more theories were then put forward to explain the planet's demise. How Was Planet Phaeton Destroyed? The obvious idea is that it was hit by some other large object. One candidate for this role is another hypothetical body - the companion star to our Sun, Nemesis. But, Phaeton could also have suffered some internal cataclysm, tearing it apart. Finally, it could simply have approached too close to Jupiter, being torn asunder by the giant planet's immense gravity. If you've read this site's page on the Asteroid Belt, you'll know that the disruption theory eventually fell out of favour, to be replaced with another, called the "accretion theory". It is now thought that the Asteroid Belt is all that remains of the "protoplanetary disc", that originally orbited the Sun prior to the formation of the planets. It never managed to coalesce into a planet simply because Jupiter's gravitational effect stopped it. So, although planet Phaeton was a nice idea at the time, it is now no more.